Philip Karter specializes in tax controversy and tax litigation matters. 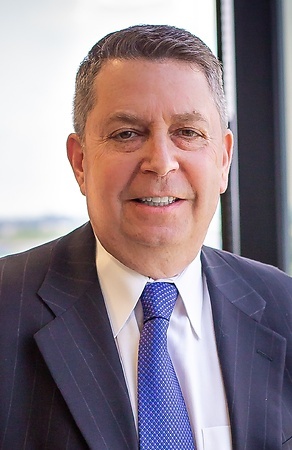 In his 34-year career, Mr. Karter has litigated Federal tax cases in the United States District Courts, the United States Tax Court and the United States Court of Federal Claims, and argued in the United States Court of Appeals in multiple circuits. His range of trial experience, which includes dozens of jury and non-jury cases tried to judgment, encompasses a wide variety of complex and high-profile tax matters, a number of which have involved issues of first impression. Mr. Karter's deep experience in the tax controversy and litigation process, working both for and against the government, also provides him with valuable insights on how to structure and document transactions to avoid future tax disputes or, if such disputes are inevitable, to position such transactions in the best possible light to successfully withstand IRS scrutiny and challenge. Prior to joining Chamberlain Hrdlicka in 2007, Mr. Karter was a partner at Miller & Chevalier and formerly served as a trial attorney with the U.S. Department of Justice Tax Division, where he was honored with the Department's Outstanding Attorney Award. Mr. Karter also is one of a select number of attorneys recognized as a national authority in tax controversy and litigation by Chambers USA and the US Legal 500 Litigation and Tax Guides and is the only federal tax controversy attorney based in Pennsylvania to receive national recognition from the prestigious Chambers ranking publication. 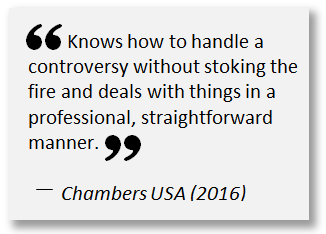 Chambers also has ranked Chamberlain Hrdlicka as one of the top tax controversy law firms in the United States for the 10th consecutive year, which coincides with Mr. Karter’s joining the firm. 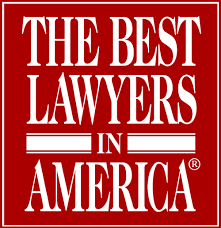 He is also perennially named in the Best Lawyers in America®, one of the legal profession’s oldest and most respected peer-review publications, and recognized as “Lawyer of the Year” in Tax Litigation and Controversy for Philadelphia in the 2019 edition. The lawyer rating service Avvo also assigns Mr. Karter a 10, it's highest ranking. Mr .Karter has spoken on a variety of tax issues before the American Bar Association's Section of Taxation, the Tax Executives Institute, the Federal Bar Association, the New York University School of Law, the Georgetown University Law Center, The Southern Federal Tax Institute, the Palm Beach Tax Institute, and various state bar and professional associations. He is currently a member of the Philadelphia Bar Association's Tax Counsel. In addition to his long career in tax controversy and litigation, Mr. Karter has worked for many years on numerous tax planning matters, with a particular emphasis on real estate investment partnerships. He presently works with real estate developers and investors in Qualified Opportunity Zone (QOZ) projects authorized by new Internal Revenue Code §1400Z. Mr. Karter also maintains an active practice assisting companies establish both § 831(a) and § 831(b) captive insurance arrangements. [April 2017] Obtained “no adjustment” letters (full IRS concessions) for a major low-income housing project developer/tax credit syndicator after the IRS conceded proposed aggregate audit adjustments of $5 million for alleged disguised sales by partnerships to their partners of state low income housing tax credits. Also obtained a full concession of IRS $1 million adjustment against syndicator claiming that sales of partnership interests were ordinary income rather than capital gain. [Oct. 2014] Represented major Fortune 250 manufacturer in nine-figure transfer pricing dispute involving valuation of intangible assets. Matter resolved/settled for approximately one percent of proposed adjustment. HealthMark Group Ltd. et al. v. Commissioner, No. 008269-14 (U.S. Tax Court, filed Apr. 14, 2014). Obtained full IRS concession in Tax Court case involving the purported application of Rev. Rul. 2005-40 to disregarded entities claiming insurance deductions paid to captive insurer. Successfully argued that Revenue Ruling was incompatible with §7701 check-the-box regulations and that disregarded entities with common ownership can achieve adequate risk distribution. Carfagno Auto Sales Inc. v. Commissioner, No. 12269-14 (U.S. Tax Court, filed May 28, 2014). Filed suit in Tax Court after adverse CDP appeal hearing on alleged deficiency in employment taxes. Obtained full IRS concession of deficiency as well as refunds of all overpayments for other tax periods that had been erroneously applied against that deficiency. Gateway Hotel Partners, LLC et al. v. Commissioner,T.C. Memo 2014-5 (Jan. 9, 2014). Lead trial counsel for participating partner challenging $22 million proposed adjustment to partnership income arising from alleged sale by partnership of state historic tax credits distributed to other partner. Tax Court ruled in participating partner's favor with respect to 89% of the proposed tax deficiency. Kohler Co. v. United States, 468 F.3d 1032 (7th Cir. 2006), aff'g. 387 F. Supp. 2d 921 (E.D. Wis. 2005) - Represented taxpayer at trial and appellate level. Obtained Seventh Circuit decision affirming summary judgment in favor of taxpayer's claim that participation in Mexican debt-equity swap did not produce short-term capital gain. Black & Decker Corp. v. United States, 219 F.R.D. 87, 92 A.F.T.R.2d 2003-6426, 2003-2 USTC 50,659 (D. Md., September 15, 2003) - Obtained ruling upholding taxpayer's claim of work product protection over documents prepared by accountant after taxpayer indicated its intention at IRS audit to rely on specific advice offered by accountant in an opinion letter previously disclosed to IRS. Black & Decker Corp. v. United States, 93 A.F.T.R.2d 2004-989, 2004-1 USTC 50,175, (D. Md., February 19, 2004) - Obtained court ruling affirming taxpayer's right to retain normally redacted information in Field Service advice that was inadvertently disclosed by government. The ruling rejected government's defense that information was protected by disclosure exceptions to Freedom of Information Act. VF Corp. v. Commissioner, No. 7584-02 (U.S. Tax Court, filed Apr. 19, 2002) - Obtained full IRS concession in Tax Court case involving the question of whether $59 million cost of providing retail display to retail customers is currently deductible or must be capitalized. Kimberly-Clark Tissue Co. v. United States, 38 F. Supp. 2d 1028 (E.D. Wis. 1999) - Won summary judgment on issue involving taxpayer's entitlement to an investment tax credit under the "world headquarters" transitional rule of the 1986 Tax Reform Act. Emhart Corp. v. United States, No. 98-1823 (D. Md., filed June 9, 1998) - Obtained favorable settlement for taxpayer seeking to deduct the costs associated with the defense against a hostile takeover attempt. Emhart Corp. v. Commissioner, 75 T.C.M. 2231 (1998) - Won taxpayer's claim to a worthless stock deduction for losses attributed to the disposition of a foreign subsidiary. Kimberly-Clark Tissue Co. v. United States, No. 97-0134 (E.D. Wis., filed Feb. 12, 1997) - Obtained favorable settlement before trial for taxpayer seeking to amortize a $100 million greenmail payment over the term of the standstill agreement provided by a hostile shareholder in exchange for the greenmail payment. VF Corp. v. Commissioner, No. 23340-95 (U.S. Tax Court, filed Nov. 9, 1995) - Obtained full IRS concession in Tax Court case involving the question of whether taxpayer could accrue and deduct costs for cooperative advertising with its retailers before claims were submitted and payments were made. "IRS Access to Computerized Records of Corporate Taxpayers," 87 Journal of Taxation (September 1997).
" U.S. Officials’ Latest Proposals to Curb ‘Abusive Tax Shelters’ Could Affect Legitimate Cross-Border Transactions," Journal of International Tax Planning (March 2000). Co-author of "Transfer Pricing for Services,"Transfer Pricing Methods - An Applications Guide," John Wiley & Sons (2004). “The Role of Economic Substance In Tax Shelter Controversies,” 19 The Corporate Counselor 8 (January 2005). The Tax Workpapers Conundrum - Will “Justice” Kagan Accept What Solicitor General Kagan Opposed?